Jack Pearse spent his entire career in youth work, education and camping. 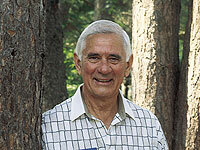 He founded Camp Tawingo in Huntsville, Ontario in 1960. He served as President of the Ontario Camping Association, the Canadian Camping Association, and the American Association of Independent Camps. In addition, he was a Steering Committee member for the Third International Camping Congress. Jack was instrumental in the formation of The International Camping Fellowship and served as the Chair for many years. A founding faculty member of the University of Waterloo Recreation Department, Jack authored many camp-related books and recorded two cassette tapes and one CD of Camp songs. He conducted leadership workshops on Camping, Outdoor Education, and Recreation in Canada, the United States, Japan, Russia, Venezuela, Australia, Colombia, and Greece. The JACK PEARSE AWARD OF HONOUR shall be presented in recognition of a person’s contribution to the Canadian Camping Association. This award is intended to recognize individuals, camps, agencies or corporations who have through their efforts provided outstanding service to the national organization.